This is probably not the typical Filipino pork stew but it is tasty and so, so simple to make. 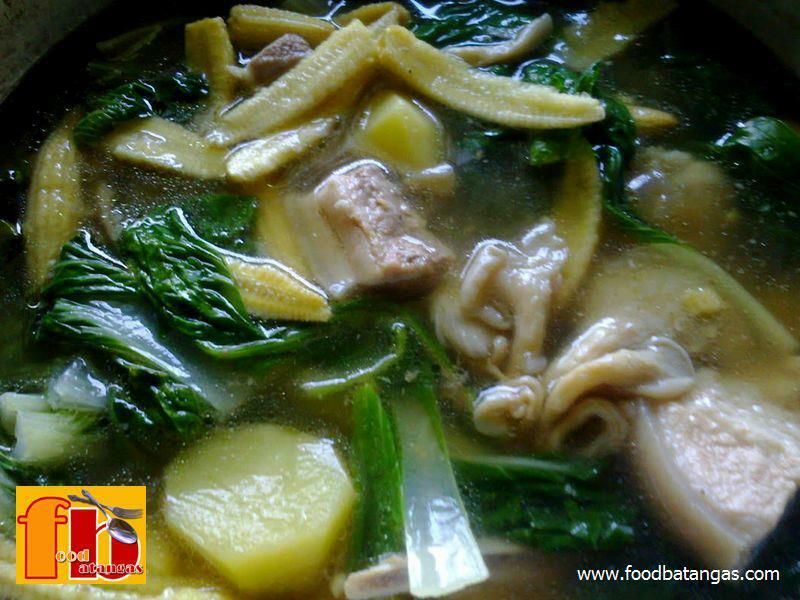 Moreover, it is a complete meal with both meat and a variety of vegetables simmering in the broth. Apart from slicing the strips of pork and rinsing the vegetables with water, there is little else to do but periodically add the ingredients to the water and wait for the entire dish to get cooked. Rinse pechay and mustard leaves well, then chop off the ends near the roots. Set aside. Rinse mushrooms well and separate the caps from the main stem. Pour water into a pot. Add more or decrease recommended amount as desired. Just make sure you later add a proportionate amount of fish sauce as well. Add the pork, salt, fish paste, onion and ground black pepper. Make sure you taste the broth later so you can add more fish paste if you prefer it to be saltier. Simmer for 20-30 minutes; more if you want the meat tenderer. Do not stir. Add the potatoes and baby corn. Simmer for 15 minutes. Add the oyster mushrooms. Simmer for 2 minutes. Add the pechay and mustard leaves. Bring to a boil and then turn off the heat.